Endearingly called the Pearl City, Hyderabad offers plenty of tourist attractions from heritage monuments to impressive museums, serene gardens and stunning resorts. Located near the Deccan Plateau, Hyderabad offers a fascinating look at the past with rich historical traditions and mixed cultures. With more than 400 colorful years that make the city, Hyderabad today is the 5th largest city in India and the capital city of the Andhra Pradesh State. There is much to see in Hyderabad, and it starts with the Charminar. Just as the Eiffel Tower is in Paris, the Charminar is a signature of Hyderabad. 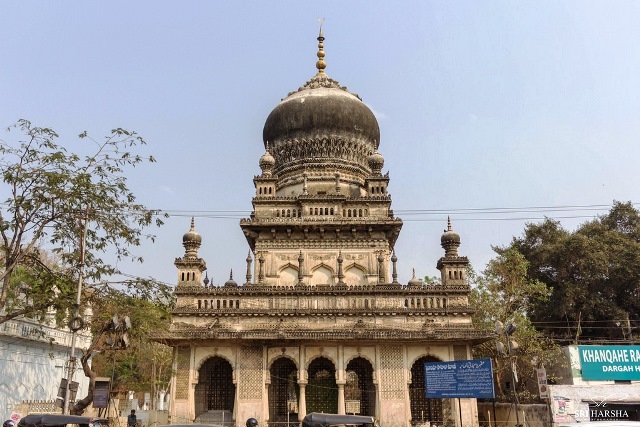 Built in 1591 by the founder of the city named Mohammed Quli Qutb Shah, the monument is said to have been built as a tool to ward off a vicious epidemic that raged at the time. Having a mosque and 45 prayer spaces inside, the Charminar has four towering minarets that glow in the evening, making great photo opportunities for all tourists. Another striking figure found in Hyderabad is the Golconda, which remains one of the most famous forts in India. Its name comes from the Telegu words “Golla Konda”, which means “Shepherd’s Hill” with origins that date back before the city was even founded. The fort remains famous for its palaces, acoustics and resourceful water supply system. But what many people see the fort for is the famous Fateh Rahben gun, which is known to be one of the cannons used in the last siege of Golconda by Aurangzeb, to whom the fort ultimately fell. However, Hyderabad is not just about all things old. Hitec city is one of the modern monuments of the city that represent trade and technology. Hitec embodies the advancements in technology Hyderabad has achieved which the people of the city do so with pride. Hitec city is also known to be the nucleus of Cyberabad, which is the IT destination in this part of the world. Other places to visit when in Hyderabad include the Qutb Shahi tombs, Birla Mandir, Salar Jung Museum and the Taramati Baradari. The city also boasts of a delectable cuisine variety and a delightful shopping experience. Being an old city possessed of the new world charm, Hyderabad should definitely be a place to visit when in the amazing country of India. If there is one place you should go to in order to really taste the traditional flavours of Hyderabad as a whole, that place would have to be Shilparamam. 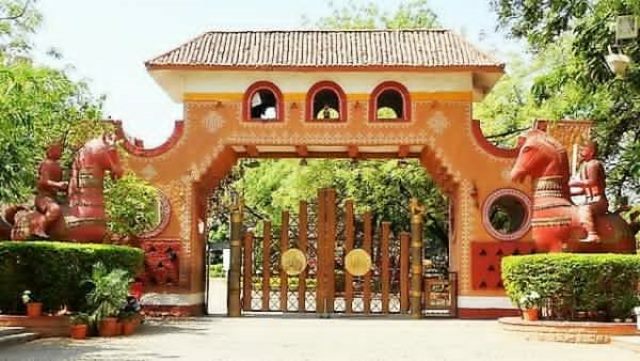 This arts-and-crafts village’s 65-acre spread is dedicated entirely to the preservation, encouragement, and showcasing of Andhra Pradesh’s artistic culture, and it is a government-run facility that is still being developed to further attract tourists as well as foster a hospitable environment for those still practising the local arts. There are dozens of things to see in Shilparamam, as might be expected of a village dedicated to the arts, but better than that, there are also dozens of things to do here: the village has an interactive approach when it comes to promoting the arts it supports, which means visitors can definitely do more than just stare at the display pieces as they would in a stiff museum. Shamirpet, one of the Mandals in Andhra Pradesh, is a curious study in contrasts—or perhaps a fine marriage between what are now typically considered two sides of the coin. Here, you get to see all the beauty of nature while still staying close to several centres of modernity, and this makes it a fine place to go to if ever you do come around the Hyderabad or Secunderabad area. 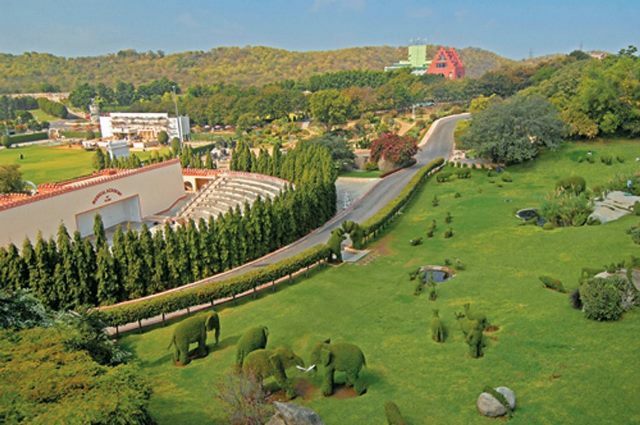 Hyderabad’s Ramoji Film City has an official world record, as certified by Guinness World Records: it is the biggest film complex on Earth, spanning 674 hectares in total and just 3 sound stages shy of a perfect 50. It is so large, in fact, that coaches and buses have to operate within the grounds to transport people from one end of the complex to another. This huge film complex is famous not just with the locals but also with the tourists, not least because it also offers packages for sightseers and even honeymooners wishing to get a taste of filmmaking in the very heart of Tollywood. When visiting Hyderabad, it is nearly impossible not to take a trip down the Tank Bund. 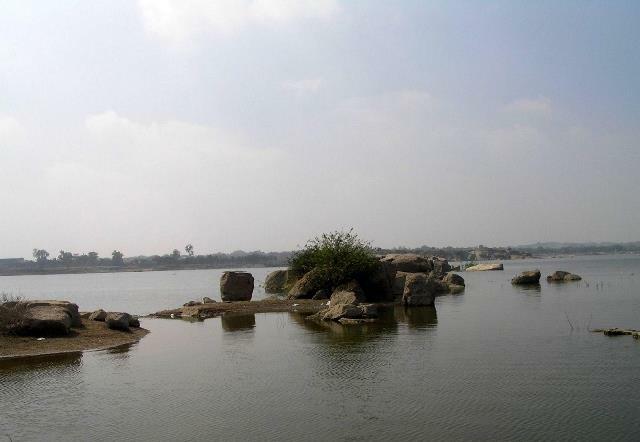 This area next to the famous Hussain Sagar Lake is a typical hangout for tourists and even residents of the city because it sports so many of the attractions of Hyderabad. From gardens all the way down to amusement parks, practically everything can be found along the Tank Bund. The government itself has played a major role in the development of the area for tourism purposes, and so you shall find that a number of the parks and sites here are fairly recent in their genesis. Hyderabad’s Hussain Sagar Lake is known for being a central point around which many of the city’s best gardens are situated. 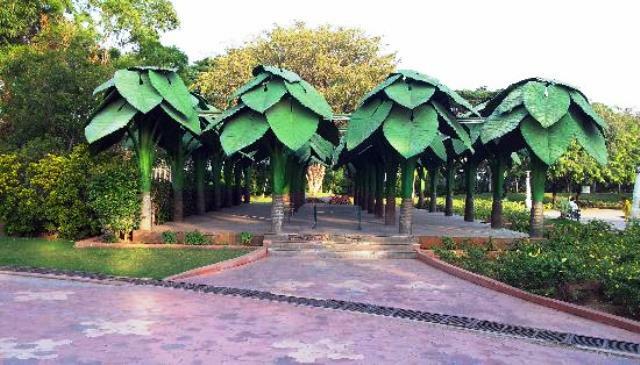 A few examples would include NTR Gardens, Lumbini Park, and the 92-or-so-acre spread of the Sanjeevaiah Park, which was given an accolade for its landscaping by the Indian National Trust for Art and Cultural Heritage in 2010. 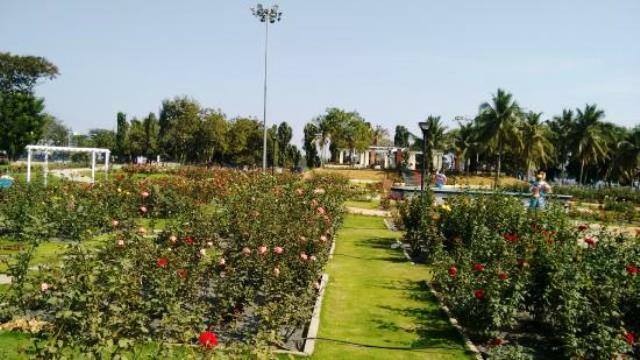 Those passing by the Hussain Sagar Lake of Hyderabad may well want to check out NTR Gardens as well. While this park is not among the larger ones in the city, it is nevertheless among the prettier ones, especially when the flowers begin to bloom. Its central location also renders it a perfect stopover if you are planning a day of sightseeing, as several of the major sights, like Lumbini Park, Necklace Road, and Hussein Sagar itself.